The heterocyclic hydrazones constitute an important class of biologically active drug molecules. The hydrazones have also been used as herbicides, insecticides, nematocides, redenticides, and plant growth regulators as well as plasticizers and stabilizers for polymers. The importance of the phenolic quinolyl hydrazones arises from incorporating the quinoline ring with the phenolic compound; 2,4-dihydroxy benzaldehyde. Quinoline ring has therapeutic and biological activities whereas, phenols have antiseptic and disinfectants activities and are used in the preparation of dyes, bakelite and drugs. The present study is planned to check the effect of the counter anions on the type and geometry of the isolated copper(II)- complexes as well as the ligational behavior of the phenolic hydrazone; 4-[(2-(4,8-dimethylquinolin-2-yl)hydrazono)methyl] benzene-1,3-diol; (H2L). A phenolic quinolyl hydrazone (H2L) was allowed to react with various copper(II)- salts (Cl‾, Br‾, NO3‾, ClO4‾, AcO‾, SO42-). The reactions afforded dimeric complexes (ClO4‾, AcO‾ ), a binuclear complex (NO3‾ ) and mononuclear complexes (the others; Cl‾, Br‾, SO42-). The isolated copper(II)- complexes have octahedral, square pyramid and square planar geometries. Also, they reflect the strong coordinating ability of NO3‾, Cl‾, Br‾, AcO‾ and SO42- anions. Depending on the type of the anion, the ligand showed three different modes of bonding viz. (NN)0 for the mononuclear complexes (3, 4, 6), (NO)- with O- bridging for the dimeric complexes (1, 5) and a mixed mode [(NN)0 + (NO)- with O- bridging] for the binuclear nitrato- complex (2). The ligational behavior of the phenolic hydrazone (H2L) is highly affected by the type of the anion. The isolated copper(II)- complexes reflect the strong coordinating power of the SO42-, AcO‾, Br‾, Cl‾ and NO3‾ anions. Also, they reflect the structural diversity (octahedral, square pyramid and square planar) depending on the type of the counter anion. The heterocyclic hydrazones constitute an important class of biologically active drug molecules which have attracted attention of medicinal chemists due to their wide ranging pharmacological properties including iron scavenging and antitubercular activities [1–6]. The hydrazones have also been used as herbicides, insecticides, nematocides, redenticides, and plant growth regulators  as well as plasticizers and stabilizers for polymers [7, 8]. Furthermore, some hydrazones are used as quantitative analytical reagents, especially in colorimetric and fluorimetric determination of metal ions [4–6]. The importance of the phenolic quinolyl hydrazones arises from incorporating the quinoline ring with the phenolic compound; 2,4-dihydroxybenzaldehyde. Quinoline ring has therapeutic and biological activities whereas, phenols have antiseptic and disinfectants activities and are used in the preparation of dyes, bakelite and drugs. The metal complexes of hydrazones have potential applications as catalysts , luminescent probes  and molecular sensors . 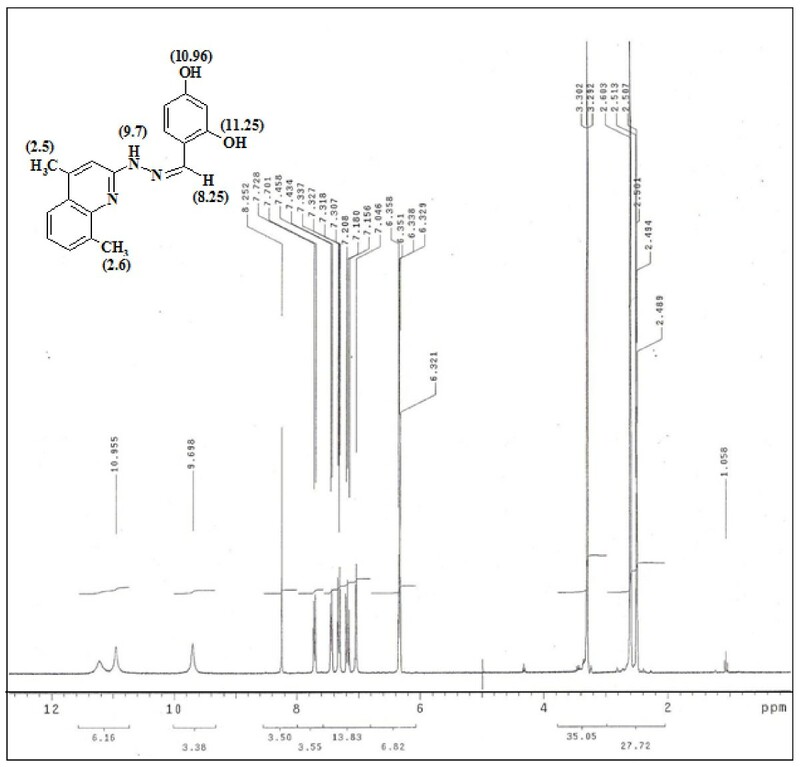 The present study is planned to check the effect of the counter anions on the type and geometry of the isolated copper(II)- complexes as well as the ligational behavior of the phenolic hydrazone; 4-[(2-(4,8-dimethylquinolin-2-yl)hydra-zono)methyl]benzene-1,3-diol; (H2L). This work is an extension to our previous studies on the chelating ability of quinolyl hydrazones [12–14]. 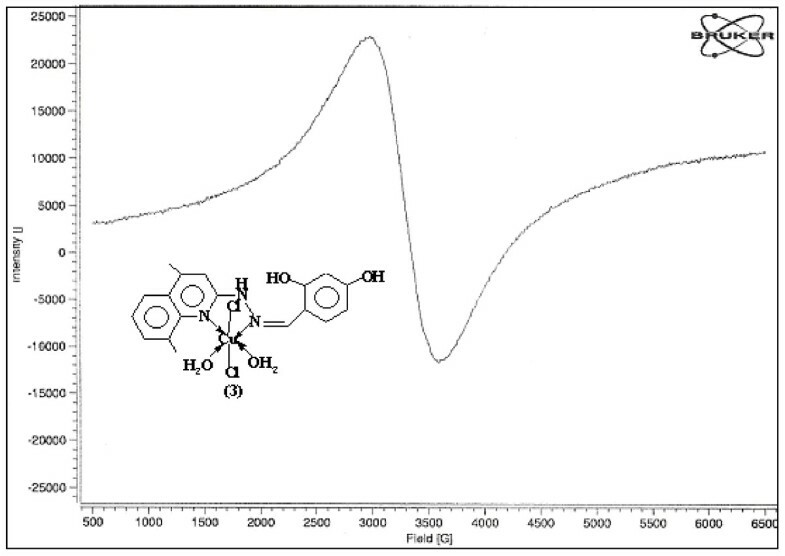 The investigated hydrazone; 4-[(2-(4,8-dimethylquinolin-2-yl)hydrazono)methyl] benzene-1,3-diol; (H2L) was prepared by a condensation reaction of 2-hydrazinyl-4,8-dimethylquinoline with 2,4-dihydroxybenzaldehyde. The results of elemental analysis (Table 1) are in good harmony with the proposed formula. The IR spectrum (Table 2) showed bands at 3426, 3159 and 1603 cm-1 assignable to ν(OH), ν(NH) and ν(C = N); respectively . On the other hand, the electronic absorption spectra of the hydrazone in DMF exhibit two intense bands at 266 and 320 nm characteristic for π-π* transitions of the aromatic and C = N group, respectively. In addition, the band at 371 nm referred to a charge transfer (CT) transition . The mass spectrum of the ligand showed the molecular ion and the base peaks at m/z = 307 and 172 confirming its formula weight (FW = 307.35). The mass fragmentation pattern (Scheme 1) supported the suggested structure of the ligand. Also, the 1H NMR spectral data of the ligand in d6-DMSO relative to TMS (Figure 1) lend a further support of its structure. The signals due to OH and NH protons are disappeared upon deuteration. Analytical and physical data of the copper(II)- phenolic complexes. Magnetic, conductivity, electronic and IR spectral data for the copper(II)- phenolic complexes. Mass fragmentation pattern of the H 2 L ligand. 1 HNMR spectrum of the phenolic hydrazone; δ = 7.05-7.73 for aromatic protons (7H). The interaction of the phenolic hydrazone (H2L) with several copper(II)- salts afforded mono- and binuclear as well as dimeric complexes depending on the type of the anion; Scheme 2. The dimeric (1 & 5) and the binuclear (2) complexes are formed via phenoxy bridging. In general, the isolated complexes reflect the strong coordinating power of the SO42-, AcO‾, Br‾, Cl‾ and NO3‾ anions relative to the non coordinating ClO4‾ anion . Also, they reflect a variety of modes of bonding as well as various geometries (octahedral, square pyramid and square planar) depending on the type of the counter anion (Scheme 2). In addition, complexes (2-4 & 6) reveal the highest affinity of copper(II)-ions for N-donors. For square pyramidal complexes (1,2 & 4), the apical position is occupied by H2O, NO3- and Br-, respectively. Structural elucidation of the isolated complexes was achieved via elemental and thermal analyses, magnetic susceptibility and conductivity measurements as well as spectral studies viz. electronic, vibration, mass and ESR spectra. Anion effect on copper (II)- phenolic complexes. Comparison of the IR bands of the free phenolic hydrazone (H2L) and its complexes revealed the following: (i) All complexes showed broad bands in the region 3423-3385 cm-1 due to OH stretches of either the phenolic or the associated water/methanol molecules. (ii) The strong band at 1603 cm-1 assignable to ν(C = N) stretch in the free ligand undergoes a shift to higher wave numbers (1641-1612 cm-1) upon complexation, supporting the coordination of the hydrazone linkage to all metal ions. This can be explained on the basis of the diminished repulsion between the lone pairs of electrons of the two adjacent N atoms upon complexation and hence, π- electron delocalization . (iii) The perchlorato and sulfato complexes (1 & 6) showed the ν(S-O) or ν(Cl-O) stretches around 1100 cm-1 . Also, the nitrato complex (2) showed the ν(N-O) stretch at 1394 cm-1. (iv) In the acetato complex (5), the new band at 1635 cm-1; ν(C = O), confirm the monodentate nature of the acetate ion. The molar conductance values (Table 2) of the current chelates in DMF (1.0 mmol/L) revealed a non- electrolytic nature of all complexes except the perchlorato- complex (1) which showed molar conductance of 175 and Ohm-1 cm2 mol-1 suggesting its 1:2 electrolytic nature. The complex (1) has 3 mol ions/mol ( +2, -1), one of which is bi- positive. In case of complexes 2-4, the relatively high values of the molar conductance may be due to their partial dissociation in DMF solutions. However, they did not reach the previously reported values for 1:1 electrolytes in DMF solutions (~70 - 110 Ohm-1 cm2 mol-1) . On the other hand, the copper(II)- complexes (1-6); d9-system exhibit μeff values in the range 1.33-2.01 B.M. (Table 2) indicating the presence of one unpaired electron. The subnormal μeff values for complexes (1, 2 & 5) indicate MII--- MII interactions in the solid state supporting either dimeric or binuclear nature of the complexes. 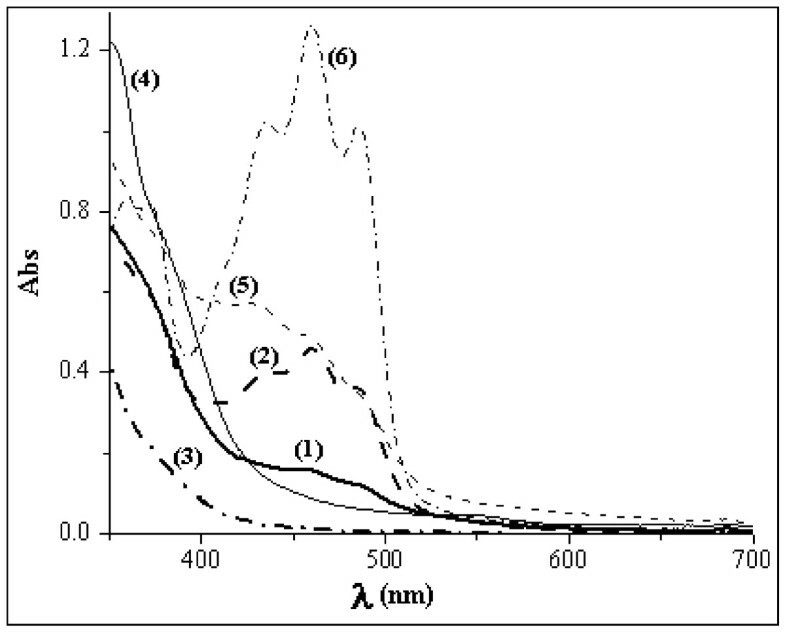 Solution electronic spectra of all phenolic complexes in DMF (Figure 2 & Table 2) are more or less similar and show a series of bands within the range 269-352 nm due to different intra- ligand transitions. Besides, the phenoxide to metal charge transfer band (LMCT transition) appears in the range 371-381 nm. In addition, the copper (II)- complexes (1-6) display relatively less intense bands at 436-488 nm that arise from different d-d transitions of copper (II) . The position and intensity of d-d bands suggest a distorted square planar, square pyramid or Oh environment around copper (II)- ion. To obtain further information about the stereochemistry as well as the magnetic properties of the complexes, the ESR spectrum of complex 3 was recorded at room temperature (Figure 3). The shape and the feature of the obtained spectrum are consistent with the Oh geometry around the metal ion. The ESR spectrum of [Cu(H2L)(H2O)2Cl2]. 11/8H2O (3) showed a broad symmetrical band centered on giso = 2.155 without resolved hyperfine structure. In particular, the absence of copper(II) hyperfine coupling is common in the solid state. Also, the absence of the forbidden magnetic dipolar transition at half field (ca. 1600 Gauss; g = 4.0) excluded the Cu---Cu interaction and confirmed the mononuclearity of the complex . The mass spectrum of complex 3, showed the molecular ion and the base peaks at m/e 495 and 45 confirming its formula weight (FW = 498.1). Overlay of the electronic spectra of copper (II) - phenolic complexes. The X- band ESR spectrum of complex 3 (O h ). The TGA data (Table 3) of the complexes showed good agreement with the results of elemental analysis. Inspection of the data revealed the following remarks : (i) Elimination of the solvated methanol/hydrated water molecules occurs in a separate step or overlapped with the removal of the coordinated ones. This stage is accompanied by a weak exothermic peak except complexes 3 and 4 which exhibited an endothermic peak. (ii) Elimination of the coordinated water molecules for some complexes is accompanied by loss of HNO3, H2SO4, HBr or AcOH acids via an exothermic or endothermic process depending on the nature of the complex and the removed acid. (iii) The TG-DSC thermogram of the perchlorato- complex (1) showed a sharp sudden inflection at 218°C with a mass loss; 94.13% via a very strong endothermic process (ΔH = 830.2 J/g); a phenomenon related to ClO4‾ complexes  (Table 3). Metallic copper was obtained as the end product via further decomposition of Cu2O into Cu. Thermal behavior of the copper(II)- phenolic complexes. * 31/8 H2O with decomp. * 2 H2O with decomp. where h, K and T are the Planck's constant, Boltzmann's constant and the mid temperature in the TG thermogram, respectively. The evaluated kinetic and thermodynamic parameters of some complexes (Table 4) reflect the non spontaneity and the endothermicity of the decomposition stages as well as the orderness of the activated species. As shown from Table 4, ΔH* has comparable positive values and ranges from 2.805-3.752 k J mol-1 for the first stage. Also, the values of A, E*, ΔH* and ΔG* increase for the subsequent degradation steps, revealing the high stability of the remaining part as well as the lower rate of the removal of the subsequent species than that of the precedent one . Thermodynamic and kinetic parametersa of copper(II)- phenolic complexes. a E*, ΔH* and ΔG* are in k J mol-1 while ΔS* is in J mol-1 K-1. Microanalyses were carried out on a Perkin- Elmer 2400 CHN elemental analyzer. Analyses of the metal ions followed decomposition of their complexes with concentrated nitric acid. The resultant solution was diluted with doubly distilled water and filtered. The solution was then neutralized with aqueous ammonia solution and the metal ions titrated with EDTA. Thermal analyses (TG-DSC) were carried out on a Shimadzu- 50 thermal analyzer in nitrogen atmosphere and a heating rate of 20°C/min using the TA-50 WS1 program. Electronic spectra were recorded on a Jasco V- 550 UV/VIS spectrophotometer. IR spectra were recorded on a Bruker Vector 22 spectrometer using KBr pellets. ESR spectra were recorded on a Bruker Elexsys, E 500 operated at X- band frequency. Mass spectra were recorded either at 70 eV on a gas chromatographic GCMSQP 1000- EX Shimadzu mass spectrometer. 1H NMR spectra were recorded as DMSO- d6 solutions on a Varian Mercury VX- 300 NMR spectrometer using TMS as an internal standard. Molar conductivity was measured as DMF solutions on the Corning conductivity meter NY 14831 model 441. Magnetic susceptibility of the complexes was measured at room temperature using a Johnson Matthey, MKI magnetic susceptibility balance. Melting points were determined using a Stuart melting point apparatus. An ethanolic mixture of 2-hydrazinyl-4,8-dimethyl quinoline (0.01 mol) and 2,4-dihydroxybenzaldehyde (0.012 mol) was refluxed for 1/2 h. The formed yellow compound was filtered off, washed with ethanol and crystallized from ethanol. The results of elemental analysis, % yield and m.p°C are shown in Table 1. A general method has been used for the preparation of all complexes. A methanolic solution of the metal salt was added gradually to a methanolic solution of the phenolic hydrazone (H2L) in the mole ratio 1 : 1; metal ion : ligand. Then, the reaction mixture was refluxed for 2-6 h where the solid complexes were precipitated, filtered off, washed with methanol and finally diethyl ether and then dried in vacuo. In general, the obtained complexes (Table 1) are colored and quite stable in atmospheric conditions. Also, most of the complexes have high melting points (>300) indicating their strong bonds. The complexes are insoluble in water and most common solvents; but they are soluble in DMF and DMSO solvents. The ligational behavior of the phenolic hydrazone (H2L) is highly affected by the type of the anion e.g. it behaves as a neutral NN bidentate donor in case of Cl‾, Br‾ and SO42- anions (mononuclear complexes 3, 4 & 6). Also, it acts as a mono basic NO donor with O- bridging in case of ClO4- and AcO‾ anions(dimeric complexes 1 & 5). The isolated complexes reflect the strong coordinating power of the SO42-, AcO‾, Br‾, Cl‾ and NO3‾ anions. Also, they reflect the structural diversity (octahedral, square pyramid and square planar) depending on the type of the counter anion (Scheme 2). In general, square planar, square pyramid and octahedral complexes rather than tetrahedral complexes usually arise from strong field ligands, the stronger the ligand, the more favored is the trans isomer. Also, the larger the size of the chelated ring (5- or 6- membered), the more favored is the trans arrangement (dimeric complexes 1 & 5). On the other hand, the binuclear complex 2 ( 2:3; M:L) has two proposed structures on basis of the results of elemental analysis (CHN); Scheme 3. However, the μeff value (Table 2) suggests two adjacent copper(II)- ions. Also, the % metal ion content (Table 1) as well as the TG data (Table 3) are concordant with the binuclear structure (2a). From the interpretation of elemental and thermal analyses and spectral studies (infrared, electronic, mass and ESR) as well as magnetic susceptibility and molar conductivity measurements, it is possible to draw up the proposed structures of the copper(II)- complexes as shown in Scheme 2. Proposed structures of the nitrato complex (2). HSS conceived the study, participated in the sequence alignment and drafted the manuscript. GAE and BAE participated in the design of the study, analysis of the data and modification of the manuscript. HSS and MAM prepared and characterized the organic ligand and its complexes. All authors read and approved the final manuscript.